Harrietville, a rural township in north-east Victoria, is about midway between Bright and Mount Hotham. The nearest alpine peak to Harrietville is Mount Feathertop (1922 metres), 7 km east. Thomas Buckland's pastoral run (1845) included the area later known as Harrietville, which came about from the discovery of gold. The goldfield was reported in 1858, and about two years later the area became known as Harrietville. The origin of the name was probably Mrs Harriet Luke, the first white woman to live in the district. In 1860 the first of several rich gold reefs was found. For several years the settlement was reached by imperfect horse tracks, and the surrounding hilly country was thickly wooded. Nevertheless local stores were established and a school was opened in 1866. In 1890 a railway line to Bright had been opened, stimulating early alpine tourism. A Harrietville Progress Association was formed, constructing a visitors' hut on the track cut to Mount Feathertop in 1906. The Victorian Railways later replaced the hut with a bungalow for walkers and skiers, and in 1925 the Country Roads Board built the Hotham Heights chalet on the road to Omeo. 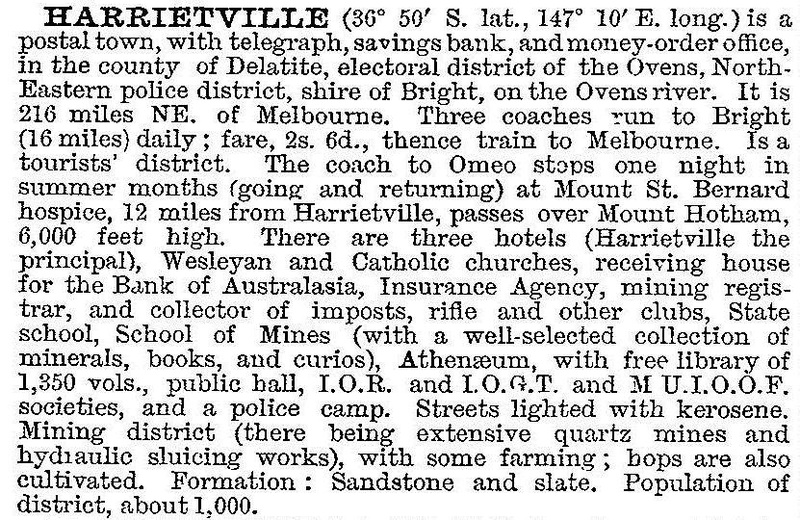 Harrietville became a supply and starting point for travellers to these places. Harrietville had a hotel and a guest house, the latter being replaced by a large camping ground in about 1960. Harrietville has a general store, a motor garage, a caravan park, a hotel, a motel and other accommodation, Anglican and Catholic churches, a public hall and a recreation reserve. The primary school had 21 pupils in 2014. An historical park beside the river describes the gold dredging era. In 2013 a large bushfire in Harrietville which burned for over a month destroyed 30,000 hectares and killed two firefighters. At the 2011 census, accommodation accounted for 25.6% of employment.